Sizeh Bedar takes place on the 13th day of the Persian New Year and marks the end of the Norouz holiday. It is customary for Persians to celebrate such day by spending the day outdoors picnicking. Families will pack their lunch and head out to the park of their choice to spend the day enjoying the warmer temperatures of spring time while hanging out with family and friends. The time spent outdoors with friends is filled with joviality and happiness. Picnic items are set out, kabobs are grilled, music and dancing takes place, as well as various fun games are played by all. 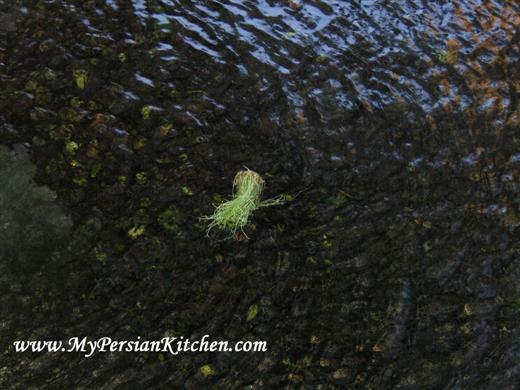 Another customary thing to do is to take the Sabzeh from their Sofreh Haft Seen and throw it in a stream, a river, or anywhere where water flows. The action of throwing away the Sabzeh represents removing negativity from one’s home. It is believed that the Sabzeh that is placed on the Sofreh Haft Seen will collect all that is negative and ill in the household during its time of growth. Releasing it into a running stream or river, then symbolizes new beginnings, as all that is sickness and ill is removed from one’s home. I find this part of our culture very symbolic as in mythology water represents purity. So throwing what is evil in water that flows is a representation of evil being literally transported away by purity. All that is not pure and good then is simply carried away down stream and does not remain stationary. Another tradition of Sizdeh Bedar is for young single girls to tie a knot with the sabzeh and make a wish to find a husband in the coming year just before throwing it out. Some also make a wish by simply tying a knot in regular grass. I personally find it very fascinating that Sizdeh Bedar takes place on the thirteen day of the New Year. In most cultures the number 13 simply represents bad luck. Ironically, Sizdeh Bedar represents the removal of all that is negative and the cheerfulness that surrounds the day can definitely be a response to Iranians’ rejection and acceptance of bad luck. What is also fascinating is the fact that generally people will play practical jokes on each other on the same day which ironically the concept behind it is very similar to April Fool’s day. I find the closeness in time and similarity very interesting. May you all have a lovely Sizdeh Bedar with family and friends! Thanks for the informative entry on sizdeh bedar…gosh I had no idea I had to threw mine into a river, I just told my hubby and he confirmed it…oh well, i shall start practicing sizdeh bedar properly starting next year. 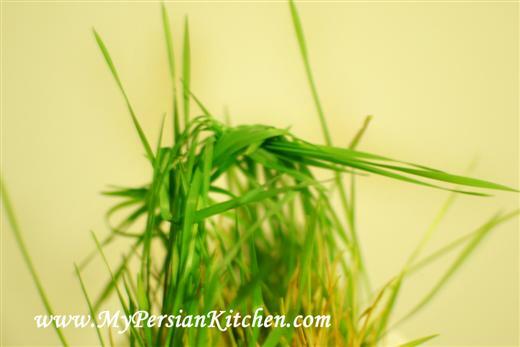 Tomorrow however I plan to follow your recipe and make Ash Reshteh…I made it once few years ago and this is my second time, hoping it will come out good. Have fun today! Very interesting! I hope your holiday was wonderful! I found your website while looking for a different kind of a recipie for Kuku-ye Sabzi for our No Rooz. I loved how you simplified everything for someone like me….I have never been a fan of cooking any kind of dishes…although I raised my family and I did feed them, I tried to stick with meat, potato and steamed vegetables menues!!! With an American husband and two sons born here, only once in a while I would throw a simple Lubia polo or khoreshe lubia in there…. Now that I take care of my mom and she is not capable of cooking the way she used to do, your site is a blessing to have . I want to thank you for thinking of creating it and making the effort to keep it going. P.S. I am the aunt who brought her attention to your site . My niece is also very talented and bright, just like you. I did love her interview with you. Afsaneh Khanoomeh aziz, thank you so much for your kind words. I am so happy to be of help!!! I am sure your mom is enjoying having someone to cook for her! Thank you for passing the word along to your niece, it was such a privilege to be her first interview! I m so pride for some one like u,you introducing very good our customs. sorry my English is not good. I congratulate to you.